The lids on to-go coffee cups look very similar from shop to shop and brand to brand. They typically have a small, oval opening for the coffee to come out when you put your lips to it and tilt the cup. It is a simple and effective design. 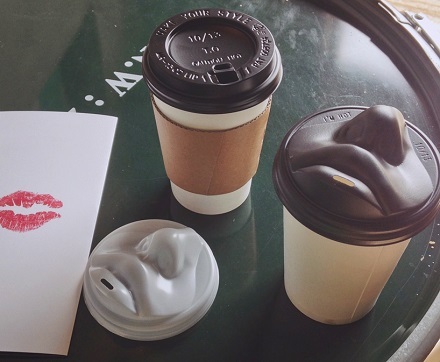 One designer in South Korea wanted to have a more interesting experience with his morning coffee and came up with the “Take Kiss Out” coffee lid. The design, which was just commercially released in South Korea, has a small nose and pouty lips shaped into it. The design combines the designer’s love of both coffee and kisses. Like ordinary coffee cup lids, it is made from molded polystyrene and snaps easily onto standard coffee cups. The designer says that initial prototypes only had the lips, rather than the whole lower half of the face, but he felt that the experience was lacking without the lips alone. While these lids are certainly an interesting conversation starter, we’ll have to see how they catch on over the next few weeks. 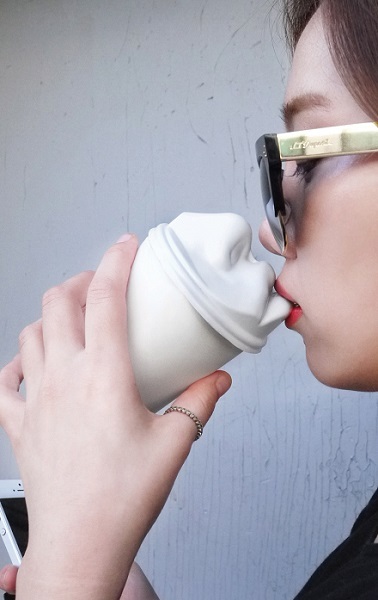 They might become the next big novelty trend – if the experience of kissing your coffee turns out to really get people going in the morning! Personally, I usually take my coffee with a kiss on the side, but I’d consider giving this a try. Would you?